American DJ LED Party PAK 2 DJParts - All Variety of Parts that DJ Needs. The American DJ LED PARTY PAK 2 is a 100% LED instant lighting package great for any mobile performer, bar or small night club. 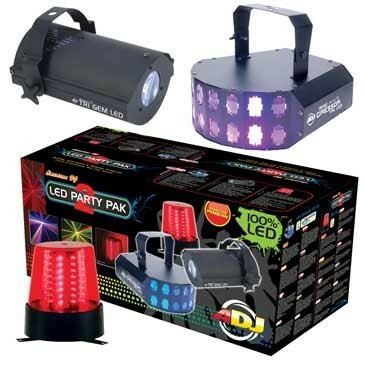 This easy-to-use lighting kit features three plug and play LED effects – No DMX or programming needed. All effects react to the beat of the music. Classic American DJ Effect - Now with LED technology 2x 9-watt 3-in-1 RGB TRI Color LEDs produces a variety of color effects (Red, Green, Blue, Purple, Yellow, Cyan & White) 48 Sound Activated beams move and strobe to the beat of music Long Life LEDs (100,000 hr. rating) Includes hanging bracket Low Power Consumption: 70W maximum Multi-voltage operation: AC 110V-240V, 50/60Hz In/Out IEC power plugs to daisy-chain power Dimensions per unit (LxWxH): 12.5”x12.75”x9.5” / 320x325x240mm Weight (per unit): 8 lbs. / 3.5kg. Classic American DJ Effect - Now with LED technology 3-watt 3-in-1 RGB “TRI Color” LEDs produces a variety of color effects (Red, Green, Blue, Purple, Yellow, Cyan & White) 23 Sound activated beams dance and strobe to the music Power consumption: 30W per unit Long life LEDs (100,000 hr. rating) Multi-voltage operation: AC 120V/60Hz Dimensions per unit (LxWxH): 8.75” x5.5” x 5.5” / 220x141x136mm Weight: 4 lbs. / 2kg. Utilizes 56 red LEDs (LED rating: 50,000 hrs.) 6 Operational modes selectable via dip switches 7 rotation speeds selectable via DIP switches Includes 3 built-in mounting plates to mount to a ceiling Dimensions (LxWxH): 6.25”x6.25”x7”/ 159x159x190mm Weight: 1.5 lbs./ .8 kg.